If you’re tired of using your fingertip or a PIN to unlock your smartphone, Yahoo suggests using your ear instead. In a project presented at the 2015 Computer-Human Interaction Conference (CHI) in Seoul this week, Yahoo showed that other body parts can unlock phones in a fast, secure manner. This approach to biometric authentication makes use of capacitive touchscreens in phones. Compared to relatively expensive fingerprint sensors, which have been deployed in higher-end phones, Yahoo’s technology can be used on any phone with a touchscreen, even cheap handsets. While not as simple as PINs, the system would be quicker and more convenient than inputting four digits. The input resolution of smartphone touchscreens is much lower than fingerprint sensors, so larger body structures are used for authentication. The researchers created an app called Bodyprint that can scan users’ ears, knuckles, palms and fingers when they are pressed against the touchscreen. The capacitive sensors in the screen register the topography of these body parts, which are unique to each individual. In a small study of 12 participants, the system was able to identify users with an accuracy of 99.52 percent, according to the research paper presented at CHI. In a demo video shown at CHI, a Bodyprint user gets a call on his smartphone. By simply pressing it to his ear, he can unlock the phone and begin talking. The authentication process takes less than a second. 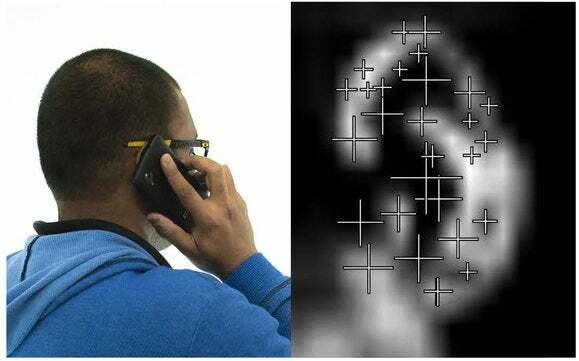 Multiple users can have their ear prints or prints of other structures stored in a phone. The scans can also be used to lock documents in the device, so that an ear print or palm print from two or more users is needed to unlock it. Holz said he and his colleagues plan to improve the recognition algorithms in Bodyprint, but would not comment on potential commercialization.